Storing files on Yandex.Disk is safer than keeping them on an ordinary computer or a phone. Yandex.Disk cannot be broken or lost. All files stored on Yandex.Disk are scanned with an antivirus. We use the latest technology to keep your files secure. All information transferred by the app or site is securely encrypted. All files up to 1 GB that you create, upload or store on Yandex.Disk are tested with the NOD32 antivirus program. How long are files stored? Until you delete them. We impose no restrictions on storage time. Note. Yandex will only delete your files if you delete your account. If you really need to delete your account, don't forget to download the files to your computer first. What should I do if I lose the device that I installed the “Yandex.Disk” app on? If you lose your laptop, computer or mobile phone, you should restrict the Yandex.Disk web app and mobile app from accessing your files on the server. Just go to the Applications page and click Deny for the “Yandex.Disk” application (desktop program) or “Mobile Yandex.Disk” (phone app). You'll just need to log in again if you find the device. 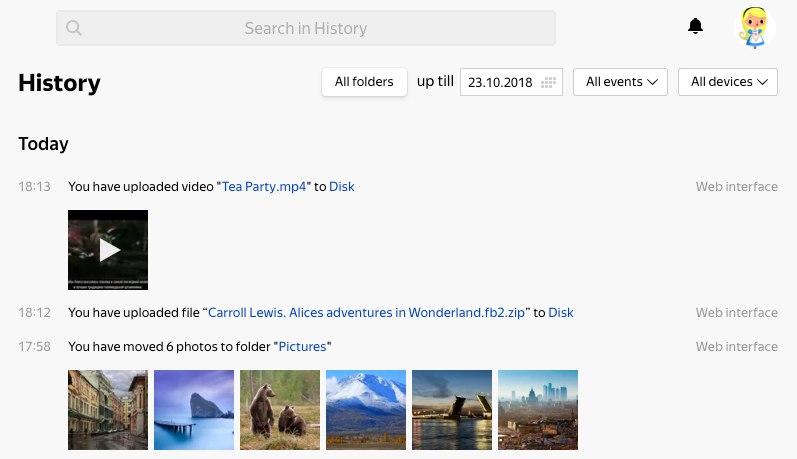 View what happened to files that you can't find (you might have moved them to another location or deleted them). Make sure that the history only displays your actions (to ensure that only you can access your Yandex.Disk). Quickly navigate to files and folders that you recently worked with. You can search for events from your History by using the search bar or filters. By name of the file or folder, contents, properties, or file extension: enter a query in the search box (top-right corner). For more information about search features, see Search Disk. By date, event type, device, or folder: enter the appropriate value in the filters. To reset a single filter, click again on the value you selected. To reset all the filters, click Clear to the left of the filters.